Resident Evil 4: over 8 million copies sold, countless best-of lists, widespread audience acclaim—the game needs no introduction. With a Nintendo Switch release also on the horizon it’s the game that keeps on giving, what more could fans possibly ask for? Well, since the 2005 GameCube launch, RE4 has had its share of visual issues regarding ports and re-releases. Two modders to hand-polish a classic? 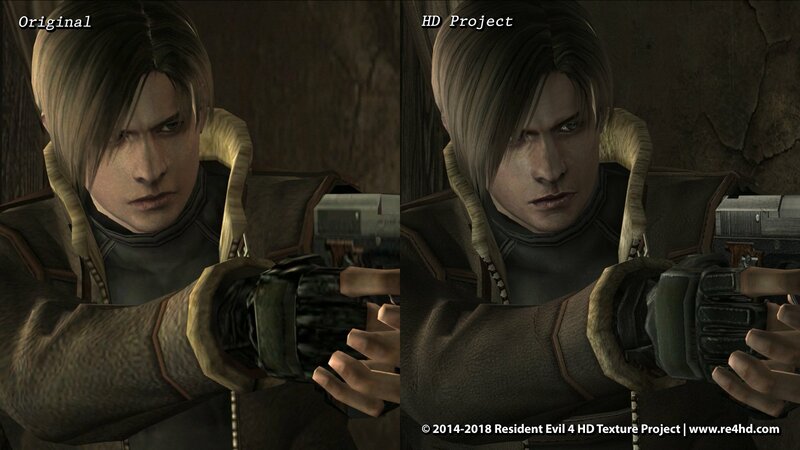 Enter the Resident Evil 4 HD Project. Two die-hard fans of the series, Albert and Cris, have taken upon the massive effort of upscaling PC port textures to give the game an even more realistic feel. Though this is Cris’ entry into the modding scene Albert is a veteran of the modding community, having created texture packs for the 2007 PC port of the game. To give you an idea of the project’s scale and their attention to detail, Albert found a stone in Spain (Segovia) that matched a wall texture in Chapter 4’s mines. Albert and Cris have been putting forth an effort most fans wouldn’t dream of, which is precisely what makes the project so amazing. We spoke with Albert to ask some questions about the trips, the process, and his opinions on design, remastering, the whole shebang. Alexander Knapp: Red9 or Blacktail? Albert Marin: Blacktail. The Red 9’s sounds and reload animation irritate me XD. But I admit the Red 9 is a classic and a really nice looking gun, and I really enjoyed remastering its texture! AK: It’s one thing to do asset work and remaster old texture packs as a hobby. But to physically travel to these locales and better your understanding of the source material is something else entirely. What spurred the decision to get up and go to all these places? AM: That’s something I’ve been asking myself too! I guess it was years of internet research to find the source locations, combined with the “emotional connection” I have with the game [that] motivated me to go to all those places. Also, half of them are in my country (several cities in Spain) and the other half are in the same continent (in Wales, to be more specific). In the end it was a good excuse to enjoy of some travel here and there, but it’s true that the main objective was to obtain as many HD pictures as possible. AK: In some cases it looks as though you’ve managed to find the exact structures and artworks used by the Capcom team as their source material, or something close to it. What happens after you identify the source? How do you make sure you have everything you could possibly need before you head home and hit the code? AM: I already had a mental list of all the places and structures I had to visit before I went to all those cities and castles. After years of internet research it was like I had already been there! So I simply looked for the walls, doors, windows, floors, etc., but I also found a lot of additional RE4 textures I had no idea were there! And I’m sure I missed a few things if they simply don’t exist anymore. It’s more than 15 years since Capcom did their source photography, and I even witnessed the destruction of one of the walls used in the game here in my city, Barcelona (it was a random brick wall near Sagrada Familia). AK: Instances in which you had to recraft assets from scratch must have been tedious. How do you go about creating these things when there is no reliable source material? What’s your approach when recreation supersedes replication? AM: Again, instinct is the main factor. We use our aesthetic judgment and try to avoid making anything stand out too much. We try to avoid evoking reactions of “Hey! This is new!” Fortunately, there are very few instances where we really had a “what the hell was that pile of pixels” moment. Other times we simply re-created some models because the original was obviously too simplistic (but we knew what we were re-creating). AK: Resident Evil 4 is a game that’s seen its fair share of ports. Compared to official releases, in what ways do you think the remaster mod really sets itself apart? AM: The problem with the ports of this game is that every port came with some technical bugs, every port was based on the previous port, and no port fixed anything that was broken previously. The exception to that is the Wii version, which is based on the GameCube version and also includes the PS2 extras, but even in that port they used the low-polygonal models and low-resolution inventory asset textures from the PS2 version instead of the GameCube models and textures! Because of that we have a PS4 game that uses PS2 inventory models instead of the hi-poly GameCube models. Marin standing alongside source artworks in Barcelona, shown on display in-game. Our project fixes a lot of these porting problems: all PS2 remnants have been replaced with improved versions of the GameCube models. We’ve restored a lot of missing and broken effects which were in the GC/Wii versions that were lost in previous HD porting processes. In brief, Our project brings the best of all ports and a remastered experience in terms of textures, models, lighting, and effects. AK: Is there a set of metrics used to decide when you’re finished upscaling textures? How do you go about deciding the level of modification that goes into remastering some of these original assets? At what point do you say “we’re done here,” and avoid getting stuck in revision hell? AM: Hehe, that’s a tricky question! I guess we stop when it looks good enough in-game. It’s somewhat instinctive and there are no rules about this. Our followers’ feedback plays an important role—sometimes we think something is good enough, but a comment from someone makes us change our minds. AK: So community feedback definitely plays a role in the process? Is there anything the community can provide that would give you more to work with, or help the project along? AM: Definitely, some people have even provided textures or picture references that helped us to make more faithful HD textures. Also, some ideas and suggestions from the community made us go back and revise certain models, lighting and effects. When you are working on something for hours and hours (remastering a texture) sometimes you lose the objectivity, or you are simply blind to inaccuracies and differences. That’s one of the reasons we post so many updates with so many comparison shots—we want feedback! We want fresh opinions from people who see the before-after comparison shot for the first time. Of course, there will always be grievances or complaints, and we can’t please everyone—subjective factors and personal tastes are also involved in projects like this. AK: Resident Evil 4 was released over a decade ago. In what ways have you had to work around the limitations of such an engine? AM: In countless ways! There are polygon, lighting, and effects limitations everywhere! Sincerely, this game is a pain to mod. So sometimes we need to take alternative routes to achieve our goals. But it’s really entertaining, and the exciting moment when we get the results we wanted is priceless! AK: Any specific examples that come to mind of ways in which you had to navigate around the code or memory limitations? AM: I remember having to add a few invisible polygons around every model in the U-3 fight room and in the cells room with the Regenerator. If you play the original game, you’ll notice the pop-in lighting issues these two areas have: when you approach a model, it becomes brighter very suddenly (rather than gradually). Adding invisible polygons at a specific distance around each model solved the problem, because Leon’s flashlight starts casting light toward the stage model sooner—i.e. when it reaches the invisible polygon—and the rest of the model gets brighter gradually as it should. You can see what I’m talking about in this video. I also changed the behaviour of other lights all over the game. At the beginning I was afraid of making a mess, but with experience I figured out a lot of the original lighting decisions made by the team were the consequence of a rushed job. AM: Sure! Now it’s really obvious to my eyes when something was done with patience and which rooms were done with a really tight deadline. The area with Ashley inside the capsule and Ada helping Leon to escape is a clear example of a rushed job. All the textures and models of that area have an unfinished “beta version” vibe. AM: Fortunately the surgery was for the better! Everything had started to develop a terrible halo, like a fog filter. Now I need glasses to see small details, but that’s why the zoom option in Photoshop is there haha. AK: Over the years, consumer audiences have slowly become aware of little tricks that are used to save on time, money, and processing power. Have the two of you noticed any tricks of the trade during your scouring of RE4? AM: Not really. The game’s PC port was poorly optimized and I’ve learned that it performs differently from machine to machine, even if they have similar specs. I’ve been lucky and my computers run the game smoothly, so I haven’t needed to look for or learn about these tricks. We have tried to optimize the file structure of this game as much as possible. For example, you wouldn’t believe the number of repeated textures in the game’s file structure. AK: Just how bad was it? Are there unexpected ways in which the repeat textures were hampering the game? AM: All the item textures are repeated in every single stage texture pack. How many rooms are in this game? Then, you have to answer for how many times the handgun ammo (for example) texture is repeated. Fortunately we found a way of redirecting all those texture calls to one single texture pack, and we replaced all the repeated files with dummy 1×1 pixel textures. In brief, that bad file structure (which is not caused by bad porting process but rather because it was like that in the original GameCube/Wii versions) would make the final HD project pack even bigger! So, it’s more a problem for modders than for users… unless you have limited disk space! The real optimization problems are mostly related to how this port was coded and its performance… but that’s something beyond my knowledge. AK: More often than not, remasters seem to fall short in terms of public reception. Can quality remasters be done by high profile studios? Or is it something that can only be achieved in this kind of “passion project” atmosphere? AM: I think developers would only spend the time and resources to make high quality remasters if they were certain that it would increase sales in a dramatic way—and for better or worse, Resident Evil 4 is a classic game that sells itself without great graphic improvements. AK: You’ve been keeping pace for a long while now. What do you do when you’re not preoccupied with the digital restoration of this classic? Are there other video games you could see yourself taking this kind of deep dive with? AM: In my case, I’d love to help a team that is re-creating the REmake Remaster background images. Also, I think it would be interesting to remaster Code Veronica textures. But I try not to think about that until this project is done. AK: Do you have a favourite remaster, or collections that you look to as examples of well-crafted works? AM: Resident Evil 0 has all I’d ask for from a remaster (too bad they didn’t keep the HD versions of the pre-rendered movies). I have to confess I’ve always been quite mono-thematic with video games—I’ve only liked a few franchises. I’ve also had no time to play almost anything in the last 4 years! But nothing will stop me from fully enjoying RE2make. I can’t wait to have it in my hands! AM: Haha well, restorations are not always as good as they should be. For example, here’s a good example that was viral here in Spain. But people seeing our project as a digital restoration, à la art restoration, is the best compliment we could receive. I have personally thrown myself into this project with the same passion an art restorer probably does. TFG Note: It went viral here too. AK: Anything more you would like to add? AM: I’d like to clarify that we are not trying to make this game look like a current-gen consoles’ game. That’s impossible with the engine this game uses. It’s just a hobby that became huge! This game will look dated even after this project is finished, but we already knew that. To me, this restoration project is like a video game and every time we finish a room, we find out how to improve something new. It’s like getting a trophy. And just like some people (myself included) try to get all the trophies in a game (perfect results, all treasures gathered, all bonuses unlocked, etc. ), I try to do the same thing in remastering this game to whatever level of perfection is possible! I know it sounds crazy haha. Goners looking to save the President’s daughter in style can download the mod from the official (and regularly updated) RE4HD Project blog: http://www.re4hd.com. For more stories you’ll love about the culture you adore, stay tuned here at Too Far Gone: for anime, video games, and everything in between—come back anytime.